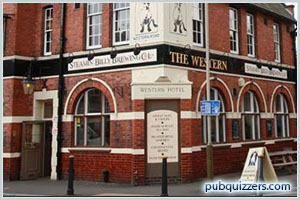 The Western | Pub Quizzers | Find a pub quiz near you, now. Pub quizzes take place at The Western, West End on Sundays (weekly) at 20:30. Entry is £0.00, you can have up to 10 people on a team. There are prizes of drinks. Happy quizzing! It’s free to enter and the first prize is a gallon of beer or equivalent drinks. In which English county is the town of Bideford?